Automated taxonomic classification of proteins homologous to members of transporter families in TCDB. Before using PhyST the following dependencies and modules need to be installed on your computer. These dependencies will allow PhyST to run on your operating system. Please visit The Standard Python Library Documentation for more details on the function of each module. Make sure PhyST is accessible in your environment or is located in a directory of your choosing. 3. The program can run without any arguments EXCEPT for the TCDB ID ( e.g 1.E.41 ). All other input parameters will take defualt values. 4. By default, the program will run two psi-blast iterations as an attempt to capture a broader range of genetic variability within the family under analysis. However, the number of iterations can be controlled with the option -i. 5. 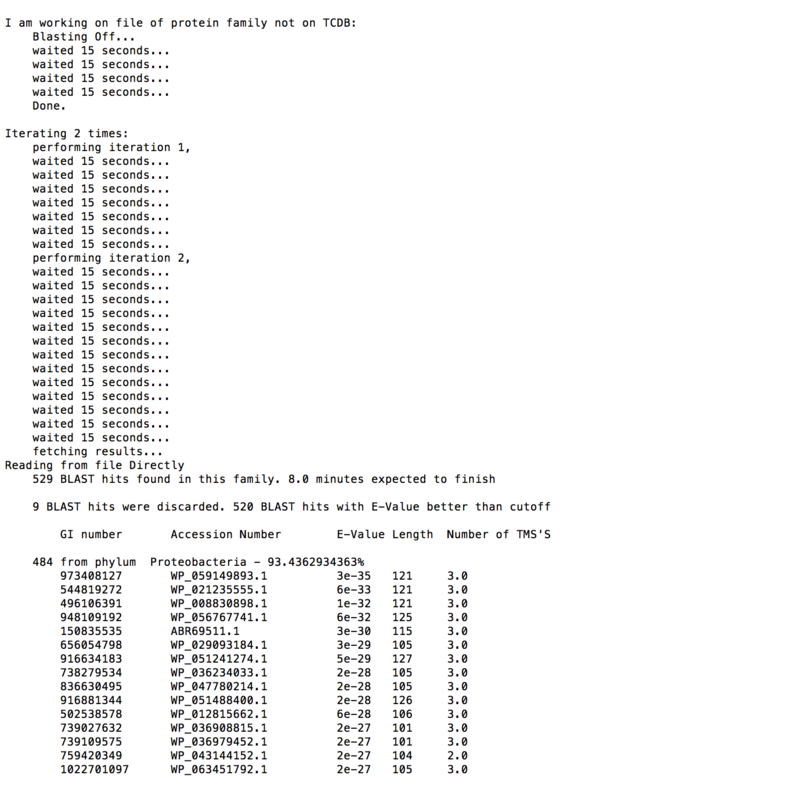 The Option -f allows PhyST to run on any protein family predefined by the user, even if it is not listed in TCDB. Example 1: Using default settings. will not run Clustal Omega. 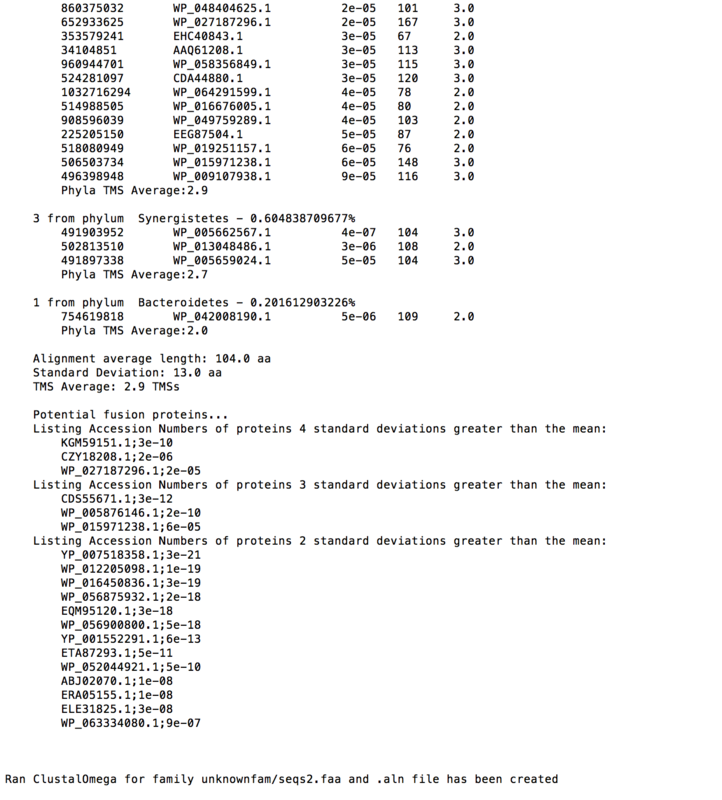 The program estimates the phyla and TMS composition within the input family (1.E.5) and returns a flat file named after that family (i.e. 1.E.5.txt). The output file is placed in the same directory were physt.py was executed. Click on the image to see the enlarged version. You can also find the output file generated by PhyST on this link. When using multiple families as input, make sure there is at least one space between TCDB identification numbers; do not use commas or any other character (e.g. 1.E.5 1.E.21 instead of 1.E.5,1.E.21). 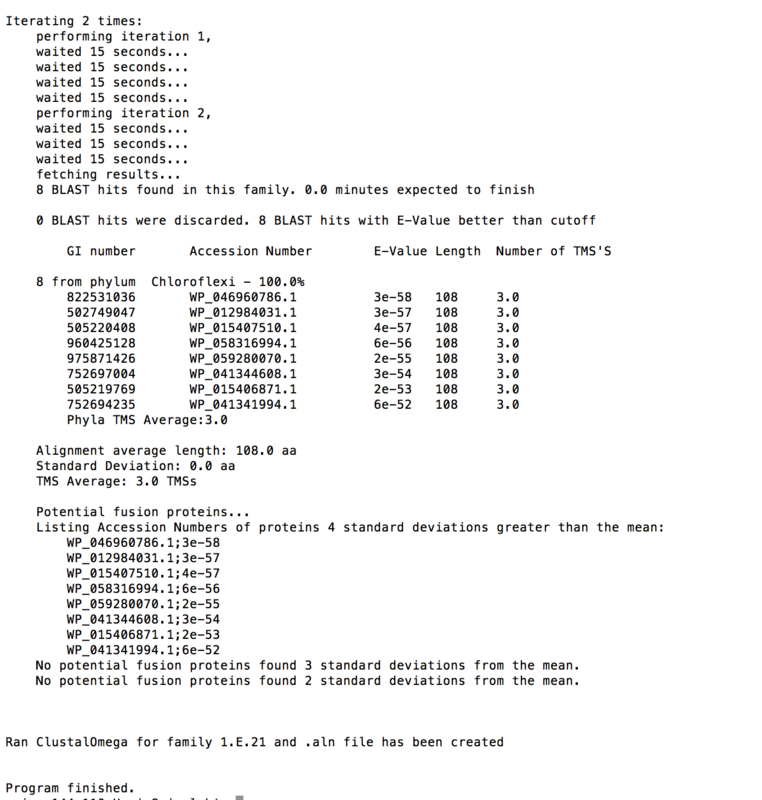 PhyST generates a file for each input TCDB family containg the sequences in fasta format of all homologous proteins found. These sequences can be used for multiple types of analyses, one of which is to generate multiple alignments. If the option -u is given, PhyST will run Clustal Omega for the user. Of course, if this option is not given, after PhyST is done running the user still has the choice to perform the alignment with any other program. When using the -u option, a file with extension .aln is created in the directory named clustalout which also contains the sequence files created for both families. 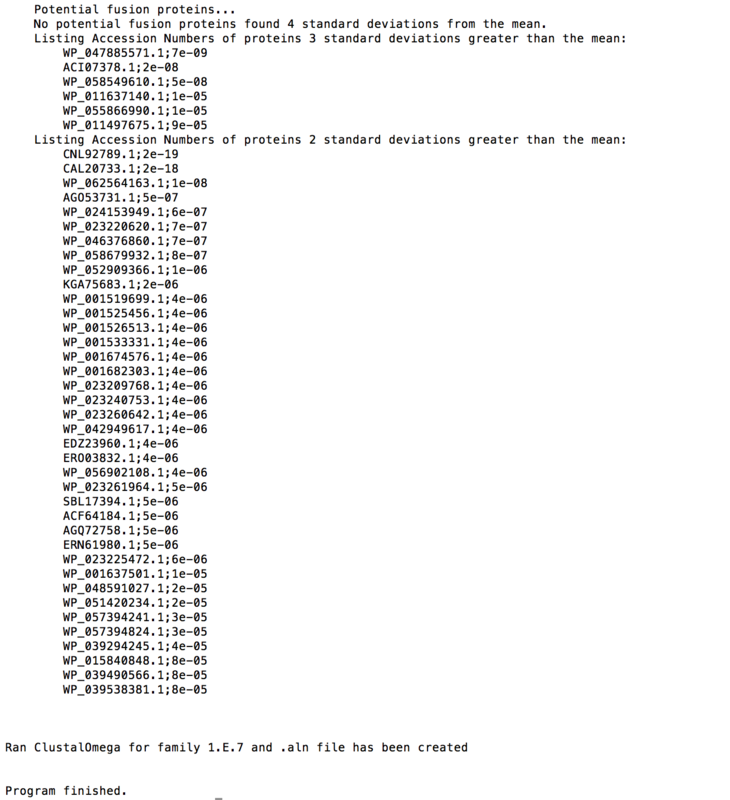 If the user prefers an alternative to Clustal Omega, the sequence files can be used with other programs such as ClustalX to generate the alignment. 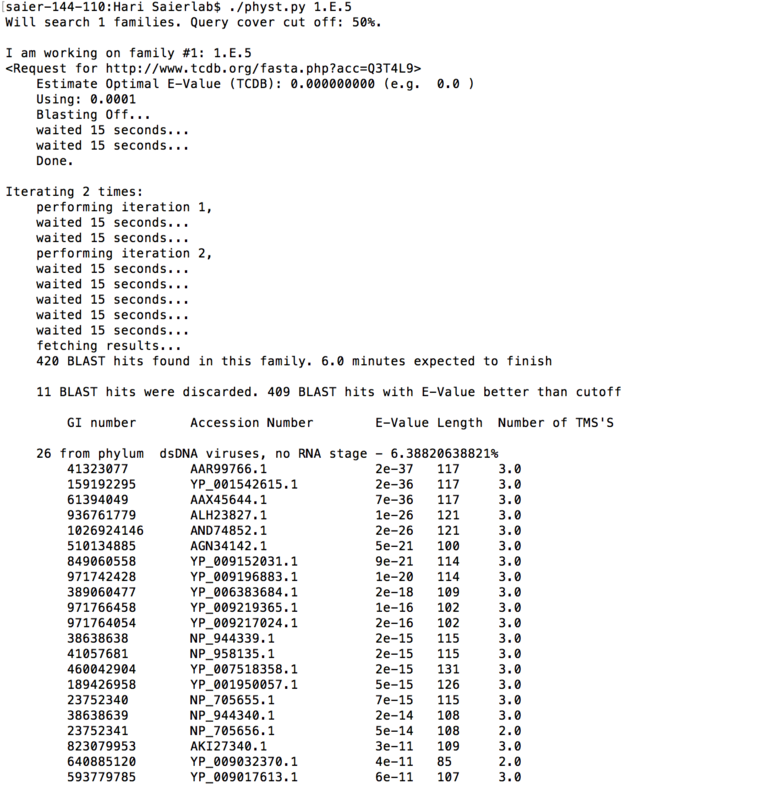 All the other parameters including query coverage, E-value cutoff and number of psi-blast iterations take default values as described in Example 1 above. Click on the image to see the enlarged version. 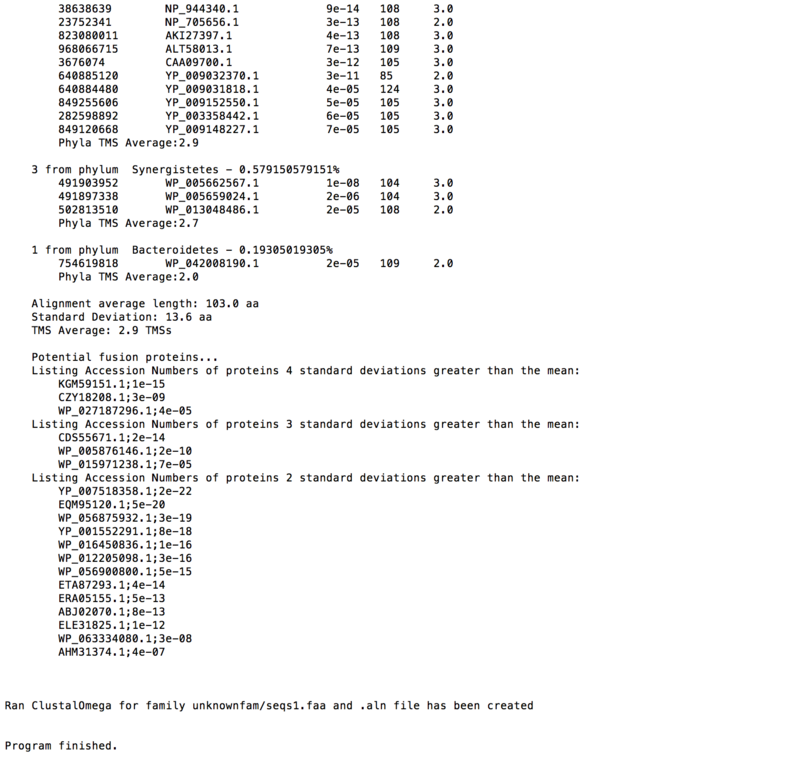 You can also find the output file generated by PhyST for family 1.E.9 on this link. Click on the image to see the enlarged version. You can also find the output file generated by PhyST for family 1.E.21 on this link. 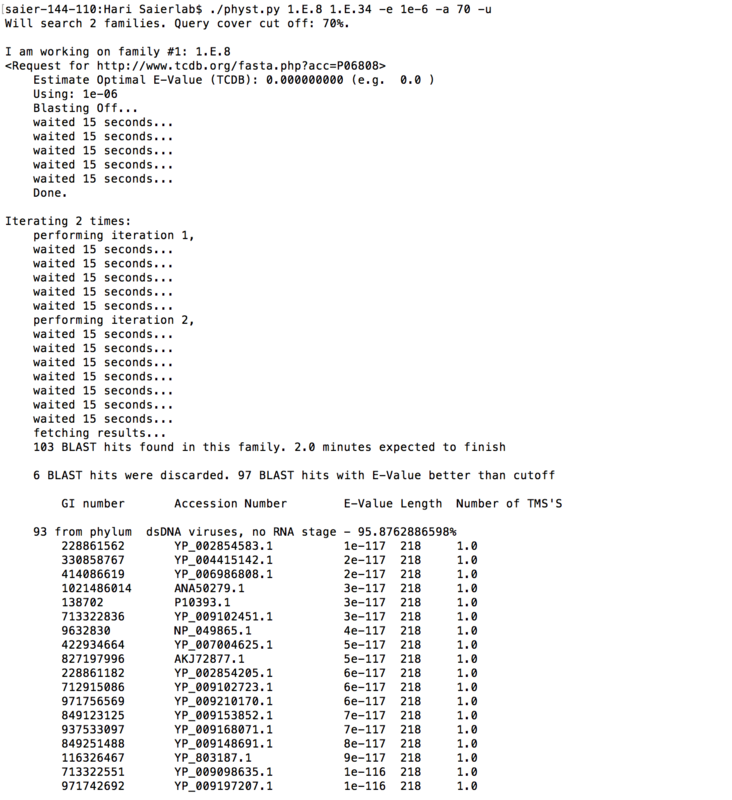 Example 3: Running PhyST with custom number of psiblast iterations and generating a multiple alignment with Clustal Omega. 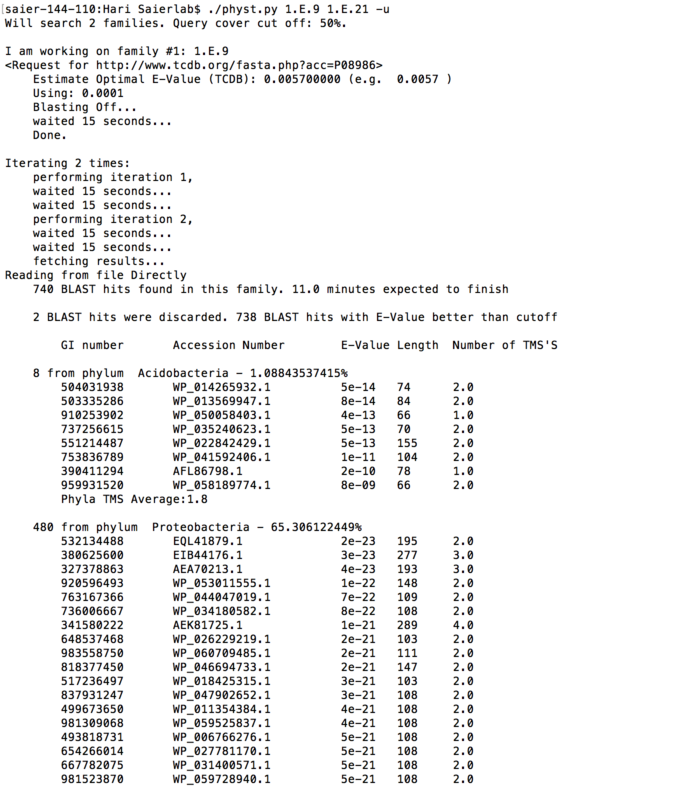 PhyST allows the user to run any number of psi-blast iterations on any query family using the -i input parameter. By default PhyST runs two iterations but any number greater than zero is acceptable. It is recommended to run more than one psi-blast iteration in order to capture as much genetic variability as possible within individual families. Click on the image to see the enlarged version. You can also find the output file generated by PhyST for family 1.E.7 on this link. 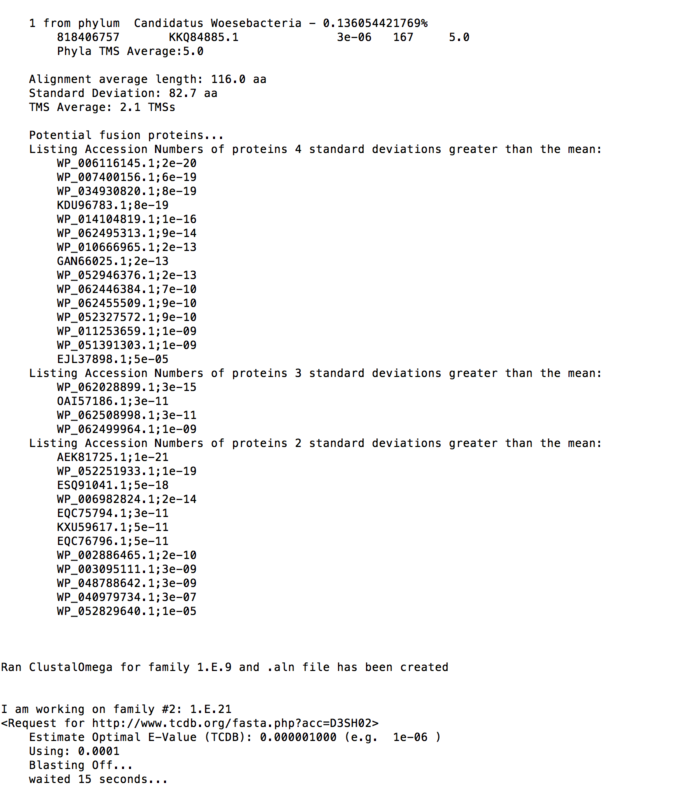 Example 4: Running multiple families with custom E-value cutoff, minimum alignment coverage and creating a multiple alignment using Clustal Omega. Physt allows the user to customize the psi-blast E-value cutoff and the minimum alignment coverage with the -e and -a input options. The option -e should be followed by the E-value cutoff (e.g. -e 0.0001 or equivalently -e 1e-4). To change the minimum alignment coverage, we need to use the option -a followed by an interger value denoting a percentage (e.g. -a 70 for 70% minimum coverage). The argument -e 1e-6 instructs PhyST to use 0.000001 as the psi-blast E-value cutoff for both families. 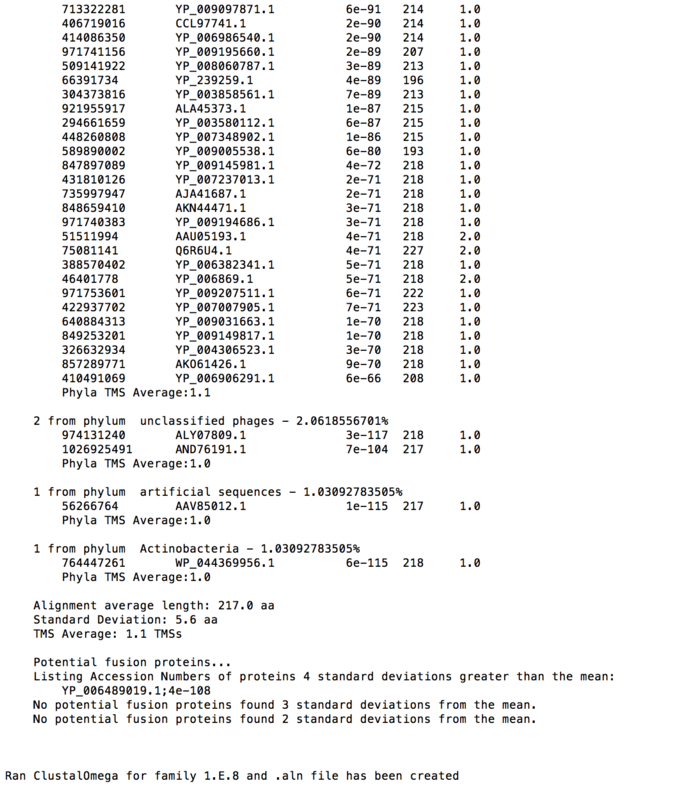 The argument -a 70 instructs PhyST to select psi-blast hits where at least 70% of the query protein is aligned. 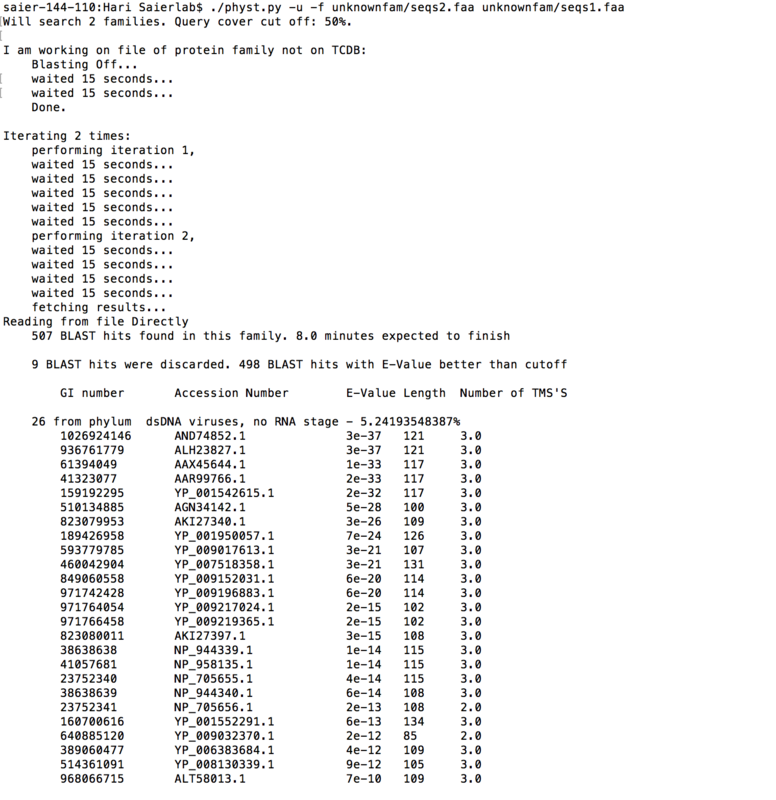 The flag -u instructs PhyST to run Clustal Omega on the output sequences and a multiple alignment file (with extension .aln) is created in the directory clustalout. All other input parameters take default values as described in the Example 1 above. Click on the image to see the enlarged version. 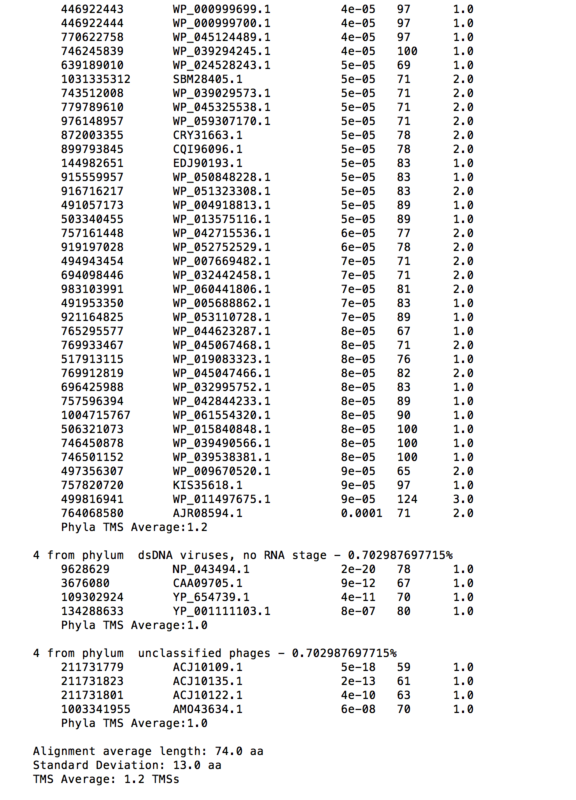 You can also find the output file generated by PhyST for family 1.E.8 on this link. Click on the image to see the enlarged version. 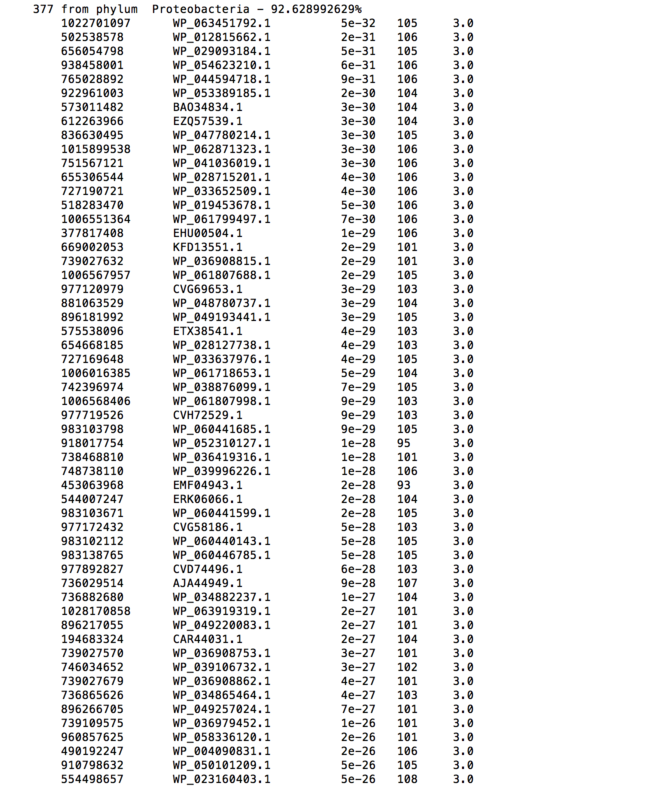 You can also find the output file generated by PhyST for family 1.E.34 on this link. 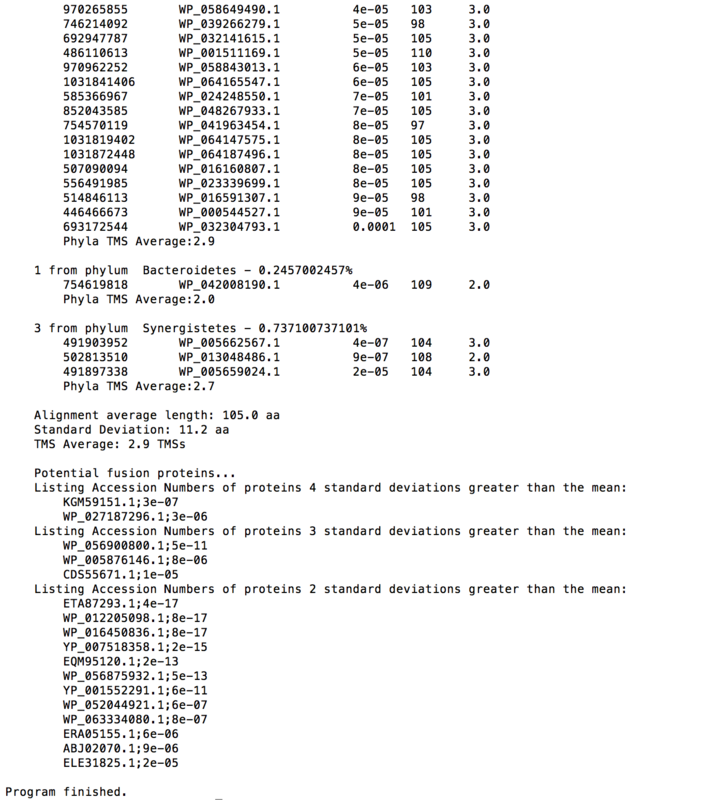 Example 5: Running custom protein families that are not present in TCDB. 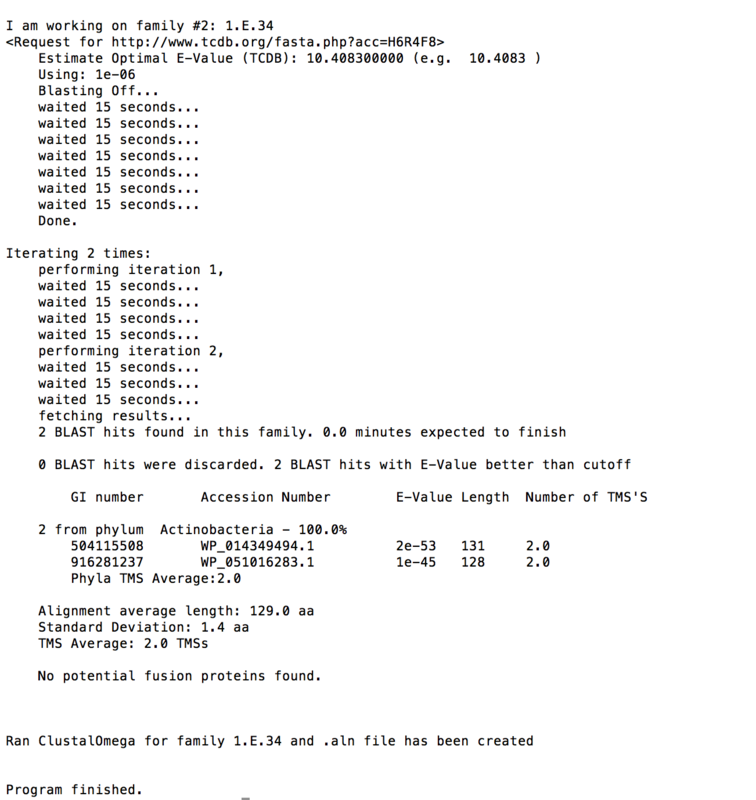 Physt allows the user to run protein families that are not necessarily classified in TCDB. As long as all input proteins are evolutionarily related, they do not need to be transporters. This is because PhyST assumes that any protein in the family is representative of the entire family. That is, running psi-blast on any family member will tend to give similar results, and the differences can be significanlty captured by running more than one psi-blast iteration. 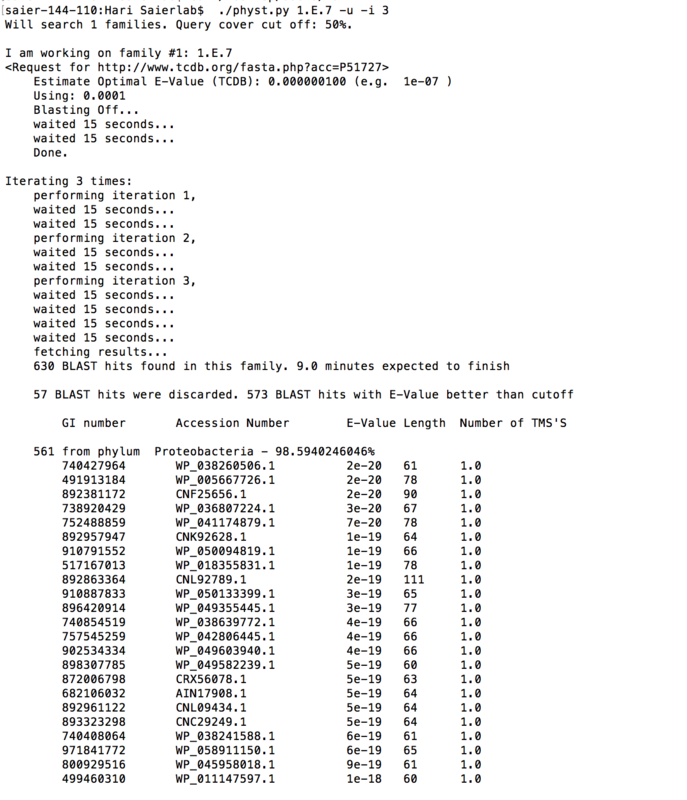 PhyST uses the -f flag to indicate that it will read files with sequences in fasta format instead of TCDB family identifiers. The sequences of top psi-blast matches and multiple alignments will be placed in a directory named unknownfam which are created in the same directory where physt.py is executed. Explanation: In this example PhyST will interpret the files with a given path unknownfam/seqs2.faa and unknownfam/seqs1.faa as input families. It will then run psi-blast on the members of each family using the default two interations. The sequences of the top hits will be saved on the directory unknownfam, and finally a multiple alignment will be generated with Clustal Omega (i.e. file with extension .aln). PhyST was developed by, Harikrishnan Kuppusamykrishnan and Larry Chau in collaboration with Dr. Milton Saier's group at the University of California San Diego. Please send any questions or comments to Harikrishnan Kuppusamykrishnan .